TGIF was asked to help soften the face of health care when Prudential introduced their brand of HMO to the Southern California market. 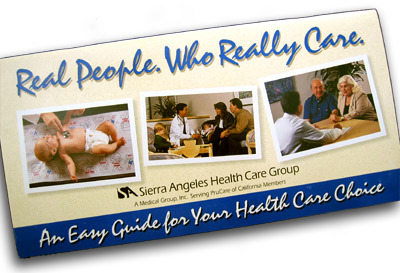 Knowing that the pevailing attitude was that HMOs were terribly impersonal, we went to work to help market a "Real People" approach to the new services. Given that the first point of contact for a member was generally the benefits brochure, we took a fresh look at what was traditionally cold and incomprehensible. Our "Real People. Who Really Care." 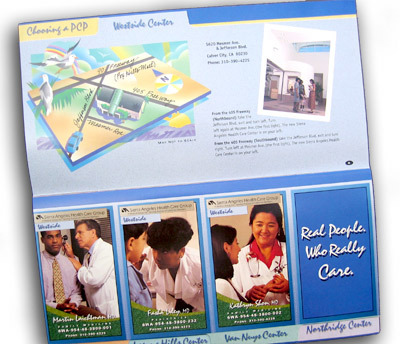 booklet focused on PruCare's real people -- the doctors and support staff. We created tear-out baseball-style cards for each of the doctors at each center -- the perfect reference item to stick on the refrigerator or bulletin board. The faces and quotes from each practitioner gave members a sense of the person so that choosing a primary care doctor became a friendlier task. We designed the maps and directions panel for each of the centers with locale-specific graphics and user-friendly copy. The results of our new-user surveys showed unusually high approval and satisfaction scores for the Center concept and the interaction with the doctors. 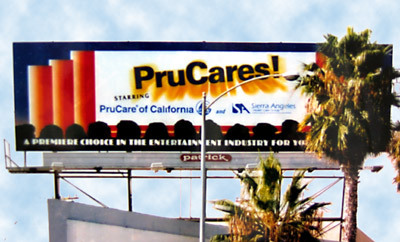 Taking the campaign to the participants via outdoor advertising, alowed PruCare to tailor a very specific message and attitude for their members at the Sony Studios in Culver City, California. This board, along a main entrance and exit street was seen by virtually every potential member during the all-important sign-up periods.